In any artwork, choosing the right printer is most important. At Superchrome, we use premier canvas paper printers to print out images or your works of art. By utilizing the state of the art imaging technology, profiling technology, and canvas paper printer, we can give the desired quality and appearance to your valued photographs and works of art. In order to print artworks and photo on canvas or paper, utmost care and attention is needed. At Superchrome, we use state-of-the-art canvas paper printers to print digital photo files at optimal resolution on high quality and elegant canvas or any other medium. 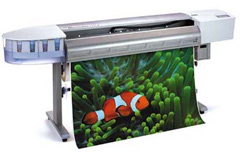 Our canvas paper printer can print your images on rigid or flexible substrates of any size. We are confident that we can offer you stunning prints on canvas. The use of pigment-based water resistant inks and UV resistant inks ensures optimum picture quality and long term stability of your pictures. Cost effectiveness, faster turnaround times, low per-print prices, simplified file transfer process, and stunning professional quality are what our clients can expect while dealing with us. Based in the United States and United Kingdom, Superchrome is a leading digital printing company that offers a full line of specialized printing services to the clients at the best prices in the market and with superior print quality. Our prints are delivered bubble wrapped if stretched and sent by Royal Mail. We assure a fast turn over time of just two to three days. Our high quality canvas photograph prints are very competitively priced. Entrust all your printing needs to us; you will find it delightful to deal with the friendly and efficient team of Superchrome. If you want to know more about our services or price lists, please browse through our online site. For questions about Superchrome or any other enquiry, we are also available on the phone round the clock. Contact us for quotes. If you would like to know more about canvas paper printer, any of the projects shown or if you want to discuss any project you have coming up then contact us 020 7237 9333 or fax 020 7237 9444 or email sales@superchrome.co.uk. Our experienced personnel would be able to guide you appropriately.